Getting started with garment decorating can be a headache at first, especially when presented with so many heat transfer options.That’s why we are showing you one of many solutions for creating an intricate design with screen-print softness using heat transfer vinyl on a 100 percent cotton shirt. 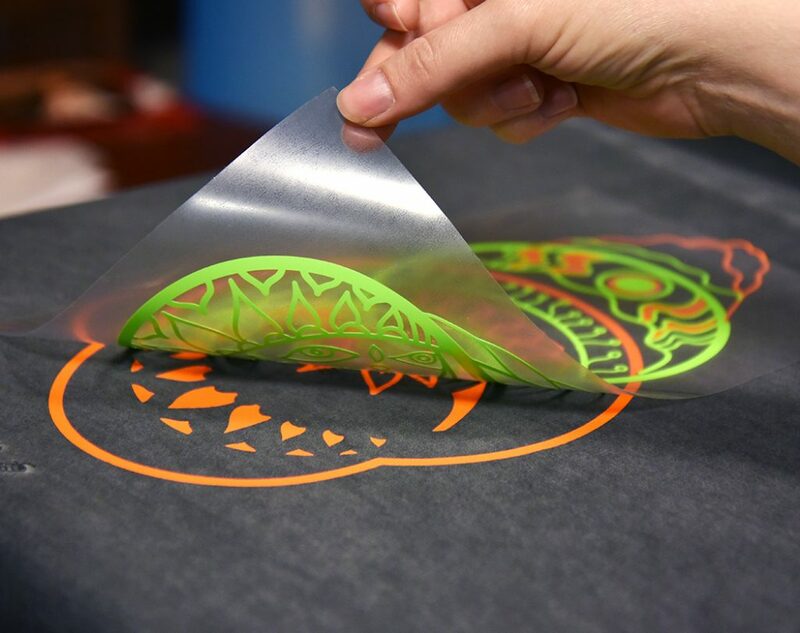 Follow along as we show you how to use Xpress Cut heat transfer vinyl, one of our favorite vinyl brands for T-shirts. Xpress Cut is also a great product for new businesses due to its easy weeding capability with a sticky backing. This vinyl can be cut with any cutter but in this case, we are using the Graphtec CE6000 24″ vinyl cutter. Our Graphtec line of cutters are perfect for small and large jobs alike! They are incredibly fast, quiet and easy to set up. 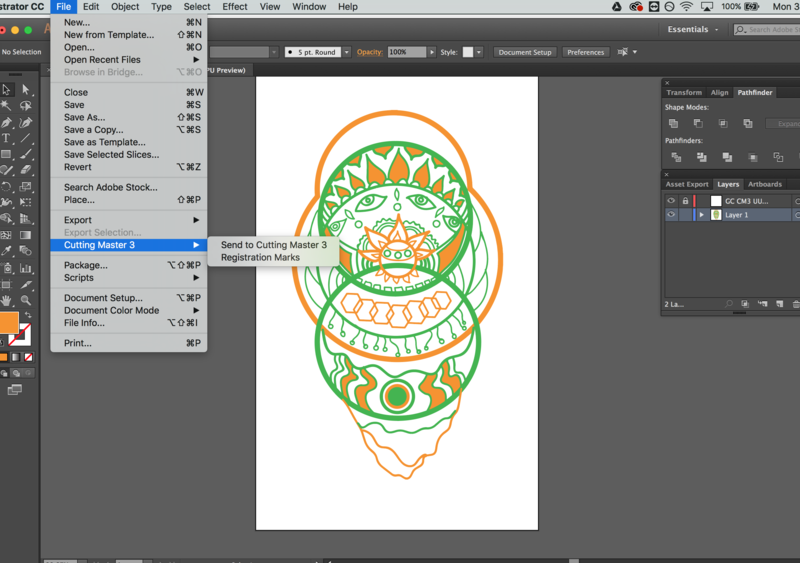 In this tutorial, we are using Graphtec’s Cutting Master 3 plug-in for Adobe Illustrator CC. If you already have your design ready, feel free to skip to step 2! Here we have our finished design in Adobe Illustrator CC. 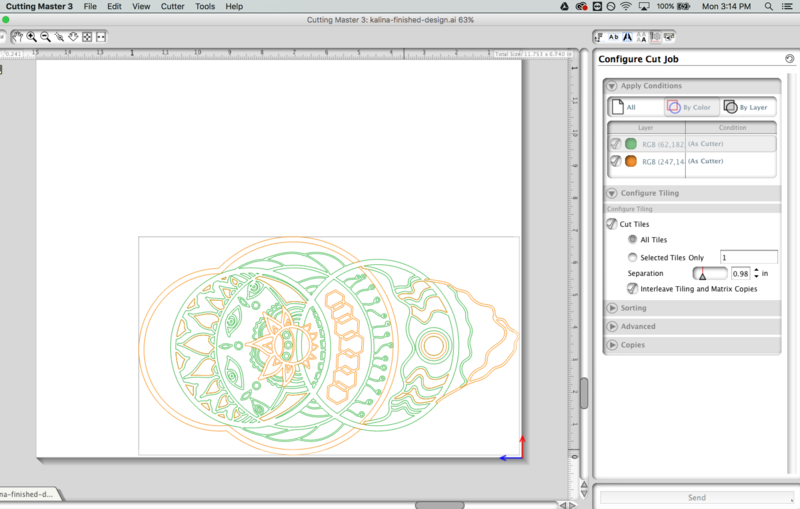 Illustrator is our favorite tool for creating vinyl designs, but Corel Draw and Graphtec Studio are alternatives. We chose to color the design to match the vinyl we are going to use. 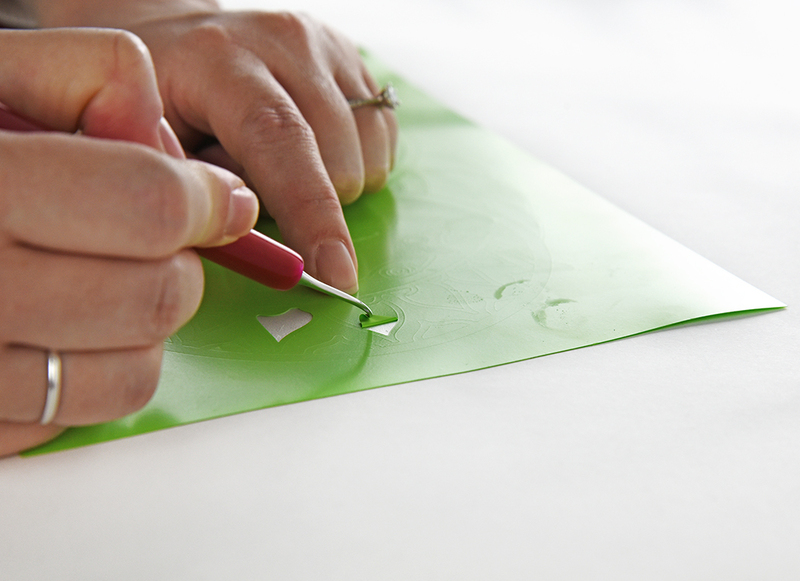 Doing this can save you headaches when it comes to cutting and applying the vinyl. Now it’s time to send our design to Cutting Master! 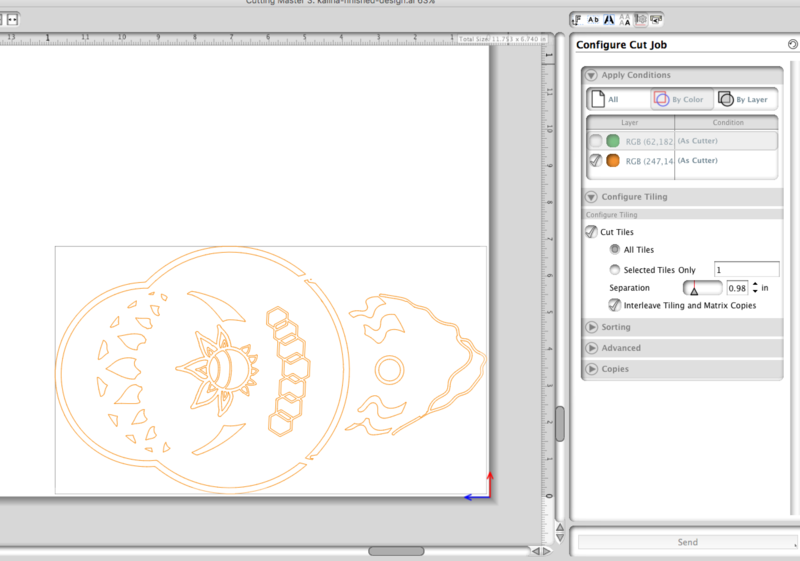 Open Cutting Master through Illustrator by going to File and clicking on Cutting Master 3 (or the version of Cutting Master that you have installed). This will open your design in a new program. The Cutting Master plug-in pulls the design from Illustrator in its original vector format with the separate colors we previously set. The program automatically recognizes that there are two different colors and makes it incredibly easy to toggle between them. Not every program can do this. That’s why we love Cutting Master! Now it’s time to cut! Tip: Don’t forget to mirror the design (flip horizontally) because heat transfer vinyl is always cut on the back side and later placed upright on the garment. This can be done in Illustrastrator or inside Cutting Master. In Cutting Master 3, go to Page Window and select your Mirror setting from the drop down under the Orientation section. Step Two: time to cut! Load the vinyl with the back adhesive side (usually the duller matte side) facing up. Tip: Perform a test cut if your machine allows it prior to sending your design to the cutter. Over time, the cutting blade can dull and the depth setting may have to be increased. Grab your favorite weeding tool (here’s ours) and weed away the excess vinyl. This stage can be sometimes the most time-consuming part of the process. Tip: When designing, the more connected your lines are with each other, the easier it will be to weed. 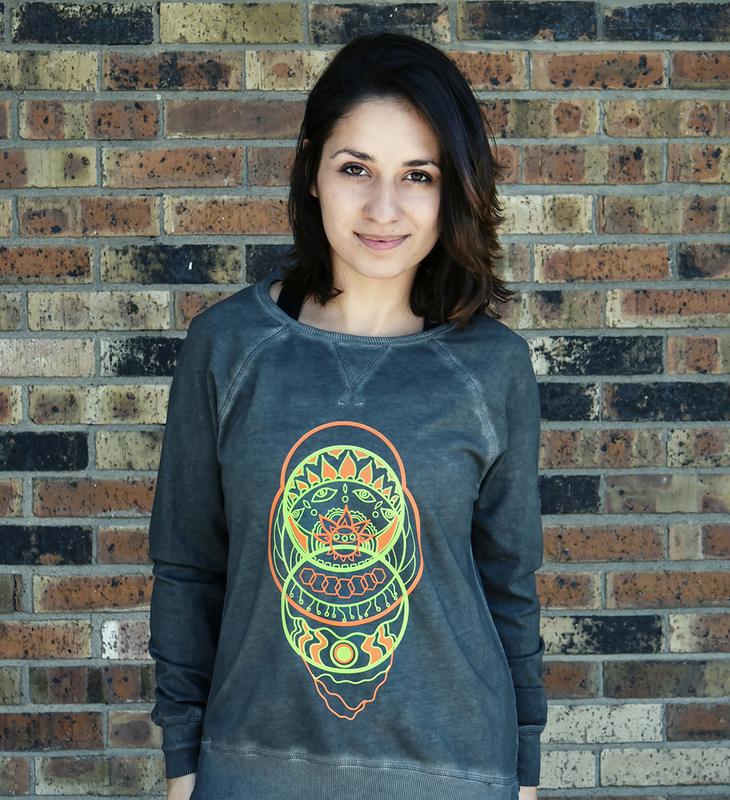 Xpress Cut is easy to layer and requires little time and low temperature, making it a great heat transfer vinyl to use on cotton, polyester, rayon and other blends. We are placing our design on a dark 100 percent cotton shirt. We are applying the orange vinyl first because it outlines the entire design and makes it easy for the next layer to line up. Set up the heat press machine to 305 – 310 F° when using 100 percent cotton shirts. For the best pressing settings for your material, visit our Xpress Cut support page! Helpful Tip: Use a foam pillow underneath or inside your shirt to raise the transfer area for a smooth, flat surface. Seams, zippers, wrinkles and other imperfections can throw off the pressure and cause the vinyl to peel later on. After pressing the design, wait 24 hours prior to washing. The finished garment is ready to be worn for many years to come! Order some Xpress Cut vinyl today and start making custom vinyl shirts with screen print-like softness. Do you have awesome creations you want to share with us? Use #InspireMeCoastal and tag us (@coastalbusinesssupplies) on Instagram for a chance to be featured on our channel! Here at Coastal Business Supplies, we believe that for our customers to succeed as business owners, digital decorators, crafters, and innovators, we have to go beyond being just a distributor of products. We personally test and work with the majority of our products and our hands-on experience gives us the power to understand and share everything we learn along the way through our own trial and error. One of our goals has been to put together all of our knowledge and resources and create a powerful Help Center platform which will provide support long after your purchase! 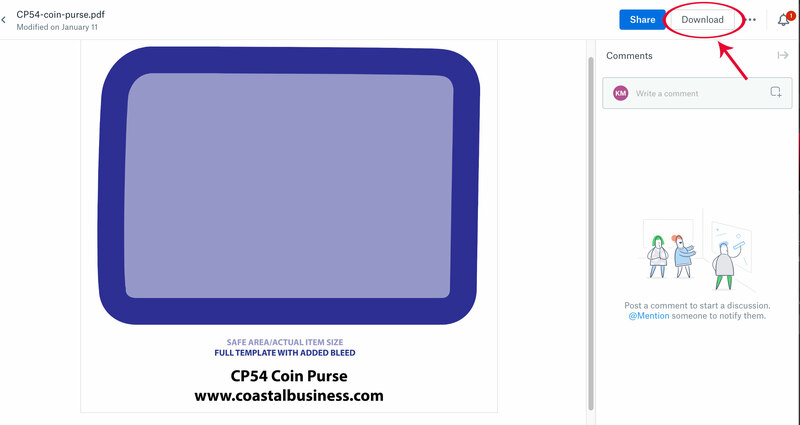 Information on a variety of Coastal Business Supplies policies such as shipping and delivery, returns and exchanges on unopened or defective merchandise, the types of payments we accept, international orders, and more. Webinars with the upcoming schedule as well as links to past webinars. Sublimation blanks pressing instructions and templates found on each product page. Application instructions and troubleshooting FAQ for heat transfer paper and heat transfer vinyl. 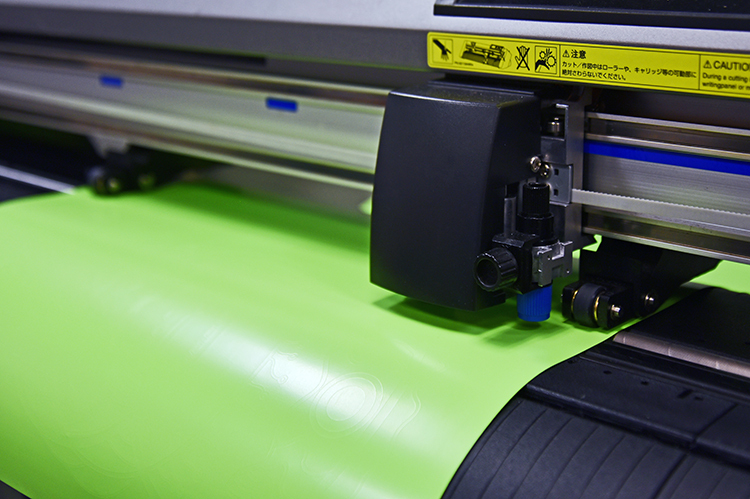 User manuals, print guides and other documentation for equipment such as heat press machines, printers, vinyl cutters and more! 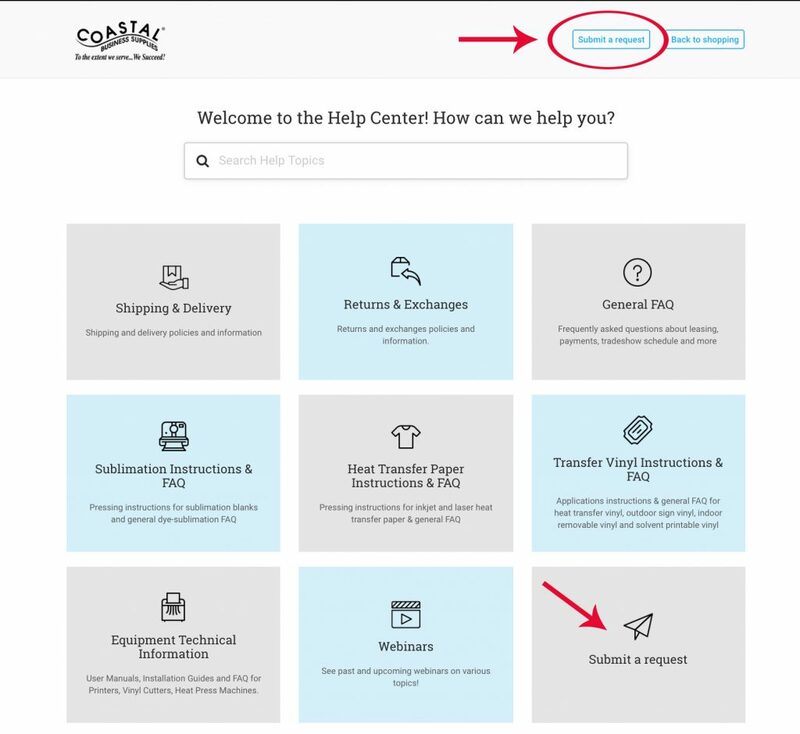 Links to our Help Center can be found throughout our main e-commerce website. On the homepage, you can find Support links in both the header (top right of the page) and footer (bottom left of the page). 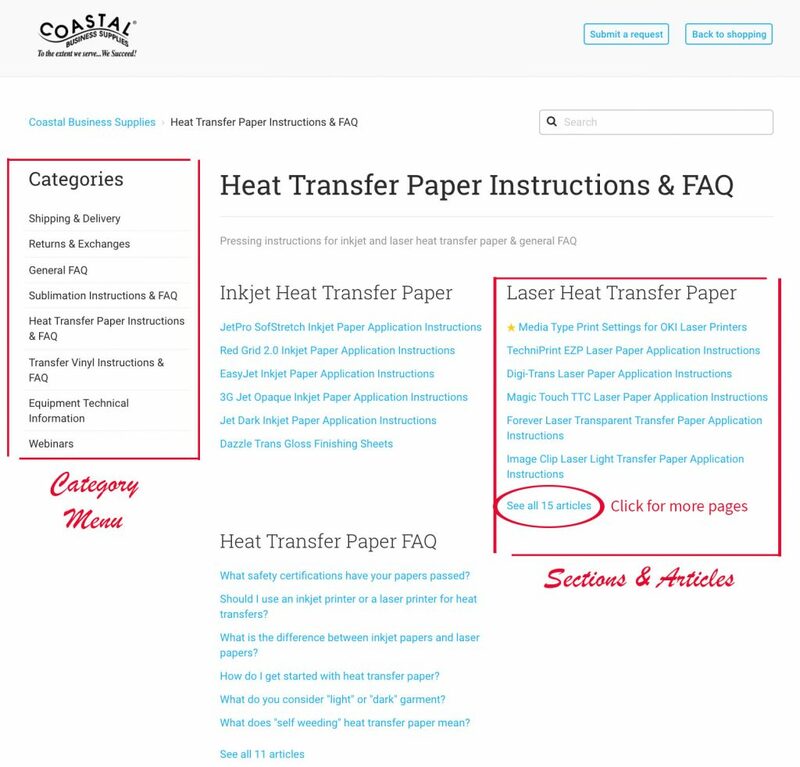 Going further into specific product pages, you can find a link to printing instructions and other documentation located under the More Information tab. 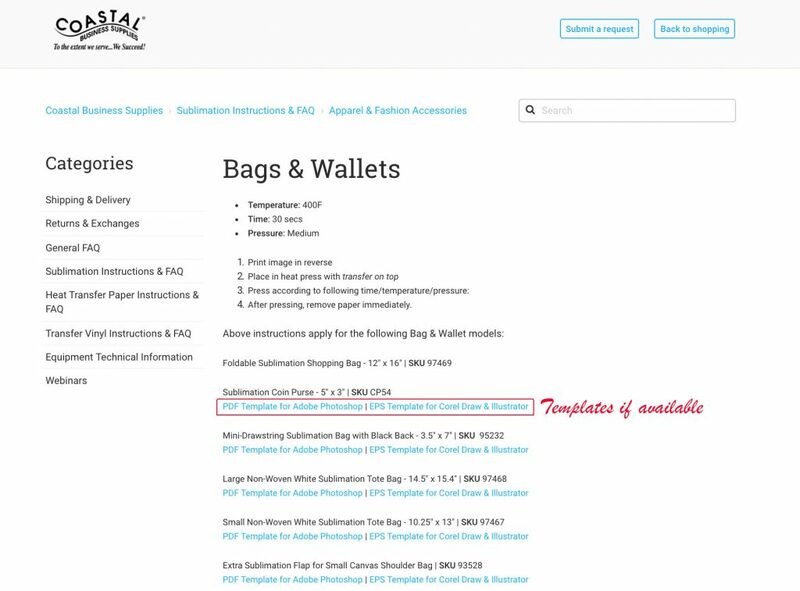 Sublimation blanks, heat transfer paper, and heat transfer vinyl are linked directly to their corresponding pages with time and temperature settings, templates and troubleshooting information. The Search bar at the top of our Help Center page is a powerful tool to quickly find the information you are looking for. If a keyword or phrase is contained anywhere on our website, it will pull it up for you together with the article. The best way to search for instructions or templates for a specific product is by product name or product SKU. For example, instructions for an 11 oz. mug can be found by typing “11 oz mug”, “ceramic mug” or “”21108” among other possible combinations. Usually, the exact product SKU will give you the most specific result, as shown below. Do you have questions or concerns? We love to solve problems and help our customers who can now easily submit a ticket on any topic. The Submit a Request link is always located in the header (top right) and the homepage has a large navigation button for even easier access. Our Help Center navigation is set up with ease of use in mind. The categories are simple to understand and accessible on the home page through the main blocks. Going further into a page, for example, Heat Transfer Paper Instructions & FAQ, you can find the various sections of topics without losing your category menu, now located on the left. Under each main section, you will find the individual pages, also called Articles. Please note that only a number of pages are displayed at once and a link is provided to view all pages under that specific section. For the time being, links to all of our available templates have been moved to our Help Center. You can find each template link directly under the product with a corresponding SKU just to ensure you are getting the correct file. Templates are available in PDF format for Adobe Photoshop and EPS format for Adobe Illustrator and Corel Draw. Once a link has been clicked on, the template will open as a new page in Dropbox.com with a Download button located at the top right of the page. Help Center is a free information platform that we will continue to improve and update with brand new material. Stay tuned for a ton of troubleshooting help, infographics, and guides. More to come!